coverage of the physical methods used, reporting not only on the results but also outlining the theoretical and experimental aspects for each technique. Introduction (H. Tsukube, H. Furuta, A. Odani, Y. Kudo, Y. Takeda, Y. Inoue, H. Sakamoto, K. Kimura, Yu. Liu). Kinetics of complexation (S. Petrucci, E.M. Eyring, G. Konya). 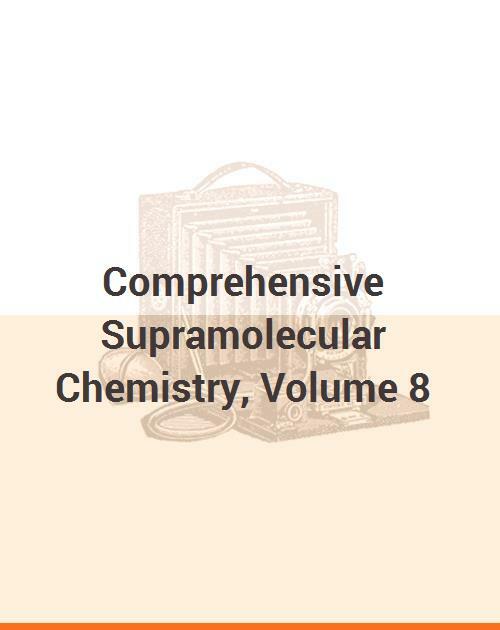 Solid-state NMR spectroscopy: applications to supramolecular chemistry (J.A. Ripmeester, C.I. Ratcliffe). Mass spectrometry (J.S. Brodbelt, D.V. Dearden). Diffraction techniques (Z. Dauter, K.S. Wilson). Surface techniques (G. Kaupp). Thermal analysis and calorimetry (M.A. White). NQR and Mössbauer spectroscopy (E.A.C. Lucken, F. Grandjean, G.J. Long). Electronic absorption and luminescence (L.J. Johnston, B.D. Wagner). Vibrational spectroscopy (J.E.D. Davies, H. Förster). Electrochemical methods (A.E. Kaifer). Dielectric properties of supramolecular structures (G.P. Johari). High-pressure methods in supramolecular chemistry (D.D. Klug, J.S. Tse). Porosimetry (C. Detellier, H. Lao). Molecular modelling (J. Tse).